Many people tell me they could give the perfect gift if they had a lavish budget. Dispirited by financial challenges, some resort to a Starbucks gift card. I literally don't buy that. There are ways to celebrate with a personal touch, for less than the price of a venti caramel machiatto. Each gift below takes some effort, but I haven't suggested anything that takes huge talent, loads of time or costly materials. Some may already be old favourites of yours, and I'd appreciate more suggestions. Melanie presented a friend with Mary Oliver's poem "The Journey", written on a card on which she had also photocopied an image of her recently-sold cottage; the friend said it was her most treasured gift. Buy a piece of heavy card stock, even cardboard or posterboard can work. If you need to trim it, take it to a print shop and ask to use their paper cutter. Your "calligraphy" does not have to be ornate, just legible and done in your hand (or that of someone willing to help you); computer-printed text is soulless. You can also decorate the piece with collage, stamped or drawn designs. Everyone gets those rough winter feet. This recipe can be used as an exfoliating scrub or mixed with water as a soak. Pack in a recycled jar, or look for antique-style canning jars at Goodwill. 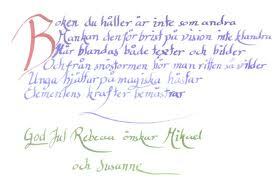 The raven feather hung on a branch; the pebble oiled and sealed to keep its sea-shine; the leaf waxed and framed. (Goodwill always has frames). A vase (again, thrifts are stuffed with them) holding a lavish tangle of dried seed pods and bittersweet. Nature has treasures on offer daily. 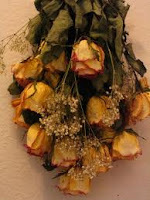 A dried rose bouquet from your garden makes a romantic gift; Simple Gifts Farm has an excellent tutorial here. Buckeye candies are not without cost, but the ingredients are not high-end. They take only fifteen minutes to make and are addictively unctuous. Here's the recipe, courtesy of AllRecipes.com. A great gift to whip up if you're in a hurry, but if you have time, buy little paper candy cups. Okay, this is a kid's project, but with the right attitude, it's folk art. And who is not a bird lover? It costs but pennies for the glue, paint (use any leftover neutral) and fishing line– and you can corral some kids into collecting twigs. One of my friends made this more arty by wrapping coloured thread around sections of some of the twigs. Big spenders can throw in a bag of bird seed. Directions right here. I enjoy making and giving this old-fashioned gift that makes a house smell wonderful without the worry of candles. You can use orange (the thick-skinned varieties), lemon, lime or even a small grapefruit; the scent lasts for years. Start two weeks ahead, to let the ball dry fully in a sunny, airy spot before you give it. Buy your cloves at a bulk store, and use a skewer or awl to make the holes first. Directions here. You can make a few while you watch TV, kids enjoy helping, and unlike the Buckeyes, you won't eat them. There, these beat a corporate gift card all the way! 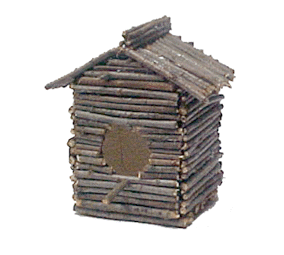 And no one will be giving the exact same thing, either, unless I've unleashed some Buckeye and birdhouse mania. These are great ideas, Duchesse! I love making those clove pomander balls, the fragrance is exquisite. Sometimes I do several in various patterns and place them in a crystal bowl as a coffee table centerpiece. Lovely, just lovely, Duchesse. This is what gift giving used to be about. Holiday commercialism becomes more and more tiresome and repugnant every year. We have taken to purchasing our gifts for family as we travel. So much more pleasurable. May I say Happy Thanksgiving to you! Pseu; Great embellishment for pomanders, thanks! Marguerite: I'm in Canada where our Thanksgiving happened Oct. 11; have a wonderful one yourself. I used to make pomander balls. I got the idea from Mary McCarthy's "The Group." The "poor" girl of the group makes them. We never could find the orris root she used. Sadly, can't do these in Louisiana--too humid. 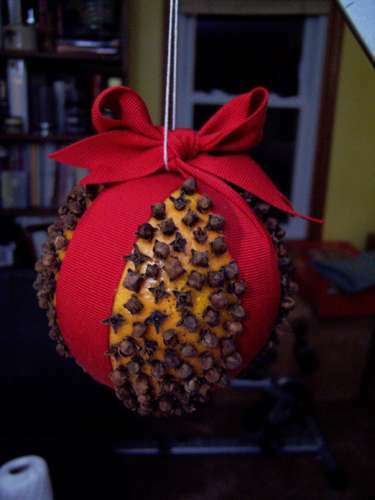 We did pomanders for Christmas decorations at church one year. They were lovely and smelled great! And the buckeyes would be a delicious treat for someone. Great ideas, and much better than gift cards. Duchesse, I knew you were in Toronto, but remembered you were raised in the American Midwest. Thus, the Thanksgiving greeting :). Thanks for the reminder that I should pick up some oranges and cloves. I've let go of so many finicky Christmas traditions over the years in the name of sanity and health -- but this one repays so richly -- and even the slowing down to punch all those wee holes and then stuff them with cloves, the stickiness of the orange juice, the slightly sore fingers from pushing the cloves in . . . such a sensory, in-the-moment process. All your ideas are great -- imagine how pleased a young child would be to help make that charming twig birdhouse for a gift, delightful! Nancy; Even Le Duc- who does not usually like chocolate and peanut butter combos- cannot resist Buckeyes. materfamilias: One of my favourite decorative objects is a pair of horses? reindeer? whatever, made by my sons when they were six. They also loved to help with pomanders. Not long till you make some with Nola! Frugal: My MILs friend in LA dried hers in the oven after it was used in the evening but still retained some low heat. I never heard how it worked but she did it every year. As a gift, I would love a notebook of favorite recipes along with blank pages to add more. I gave one of these to our daughter in law and she says it is her favorite cookbook. As a stocking stuffer, I plan to give our dil my newest favorite shampoo and conditioner---volumizing shampoo and it's matching conditioner by Burt's Bees. I also enjoy giving (or receiving) a selection of teas in individual tea bags. A rain gauge is always welcome as is an outdoor thermometer. And, I love the clove pomander balls as well. Wonderful ideas! I haven't made a pomander ball for years, but I think I'll do some for this Christmas thanks to your reminder. Susan: A notebook of recipes is a wonderful idea! I too like giving and receiving teas. Lovely. Thank you for the reminder that spending money is not a substitute for being thoughtful. I'm really big into useful gifts---or gifts that can be used up. I try really hard to be thoughtful in what I choose. When it concerns family members, I often ask for suggestions---or for something I can give them that they really want or would have to buy. Our son and daughter in law are asking for cloth diapers (from a diaper system with covers) for their 3 month old. I love giving wonderful bars of fine quality bath soap like L'Occitane. It's the soap we used in our shower now--and I would love to be given a bar. It's a small gift--but very luxurious. Sometimes I give the gift of a loaf of bread--that I have made myself. Susan: While purpose of this post was to suggest ideas for very low cost yet pleasing gifts, some of them can be consumed. Good soaps are a lovely gift. Oops, I strayed a bit from the subject, but low cost and consumable would be my favorite kind of gift. I usually do a painting as a gift, but the problem is having both the time and the inspiration. It is nice to see them hanging on many walls. lagatta: If your friends admire your paintings, that's a generous gift indeed. I know artists whose work I long to own. Duchesse, fabulous ideas. I am blessed to have a friend who writes poems and sketches on personalized cards and letters she makes for her closest friends. Not just for the "big" events, but just because we are friends and have shared so much. A little dinner party, a movie night out, lunch by the pool in the summer... basically just being with each other can spark her appreciation of our friendship. It goes without saying that they are priceless treasures that she enjoys making and we love getting. Christmas would be a wonderful time to start this tradition with others. Maggie: Treasures indeed and I love the idea of celebrating no only formal holidays or milestones but the everyday, too. She seems like a women who truly appreciates her friends, and we all can learn from that. Because I knit, I like to give people warm fuzzies. But I've learned not to make things in pairs, since I've so often wrapped up a mitten and a hank of yarn, with the promise (which often wasn't kept, I'm ashamed to say) to finish the second one later. Hats (felted or not), scarves, felted hot water bottle covers or tea cozies. These are much more achievable projects -- especially those felted goodies that you knit in a trice on ginormous needles and then shrink down to size! I'm looking forward to trying your scrub "recipe" for a few special friends. Rubi: Knitters have an edge. In the late '60s I knit a turtleneck sweater for my boyfriend for Christmas. But something went wrong and the neck accommdoated a head the size of a tennis ball. My mother was able to fix it. I would not have had the nerve to present one mitten. The foot scrub is going to be made at my house TODAY. As a gift for me. I may make a big batch so I can share it but it with all the walking I've been doing I need this one myself.